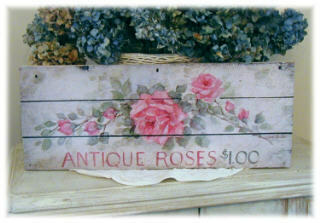 I am sooo happy to bring to Katies Rose Cottage another amazing rose artist , Debi Coules ~ Each of Debi's garden signs are prints made from one of her original paintings on antique wooden panels. It is almost impossible to tell the difference between the original and the print! Each print is masterfully produced on high quality Archival Paper and using Archival Inks to ensure a lifetime of beauty. Each Plaque is hand cut, fully painted and is approximately 3/4 inches deep. 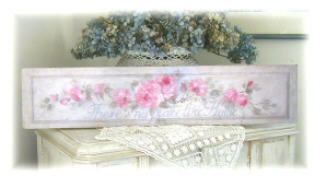 Numerous steps have been taken to create a truly BEAUTIFUL work of art with that vintage appeal and charm. 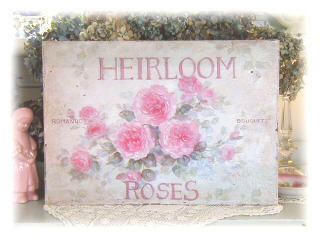 Hung by itself or in a grouping it will certainly bring that touch of Romantic Garden to your home. Each print is mounted on board, sealed for protection and comes ready to hang and each is signed and dated on the back by Debi Coules.